You know that crisp, cool day, just before the heat of summer yields its scorching temperatures, that seems to come out of nowhere to remind us that fall is around the corner. There is at least one of these “foreseasonal” days towards the end of each season. It’s like the universe’s way of giving us a heads up that something new is coming. I realized a couple decades ago that this gift of the universe is not exclusive to seasons. For every significant experience in my life, there have been similar moments of peering forward that let me know where I was headed. I remember riding up the elevator of The Baltimore Sun ~ I’m not sure if it was a particular smell, or the way the light was reflecting off of the stainless trim on the elevator door, but I do know that in that moment I heard an internal voice say, “I will be working here sometime soon.” Sure enough, within a few months I was. I am guessing that I am not the only one with these semi-psychic experiences. I am also assuming that this phenomenon is not reserved for individuals, but can be more generalized. 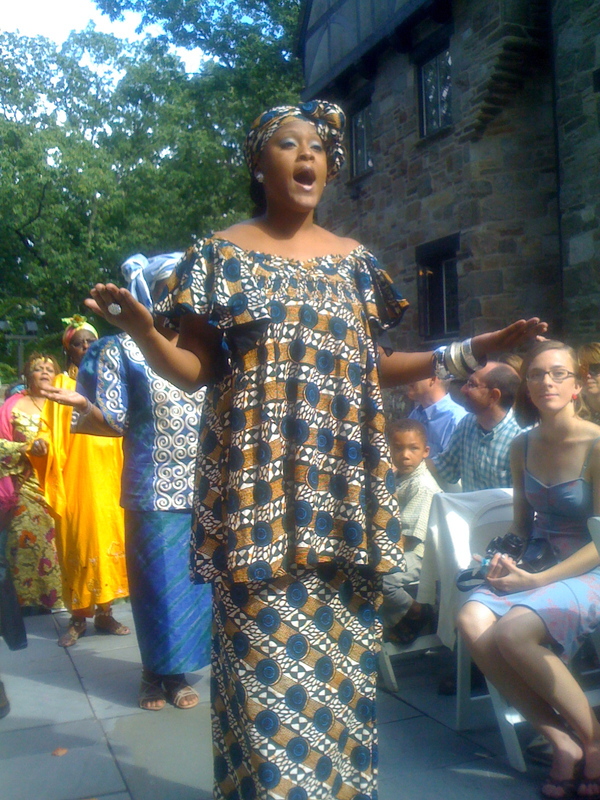 I was at the wedding of two community changers in Baltimore recently. I am only semi-sentimental. Well, that is a semi-lie. But I certainly don’t cry when there is nothing but the architecture of ceremony to evoke emotion. This was different. Really different. It was a perfect day. Billowing white clouds. The temperature was warm enough to hold you, with a breeze that kissed you cool just when you needed to feel it. The setting was an absurdly enchanting place ~ The Cloisters. It looked like a full scale gingerbread castle, with a glistening slab mica schist roof ~ impossibly heavy, and absolutely eatable. Flowers abounded, bursting out of the earth like I remember from my childhood visit to Hawaii. 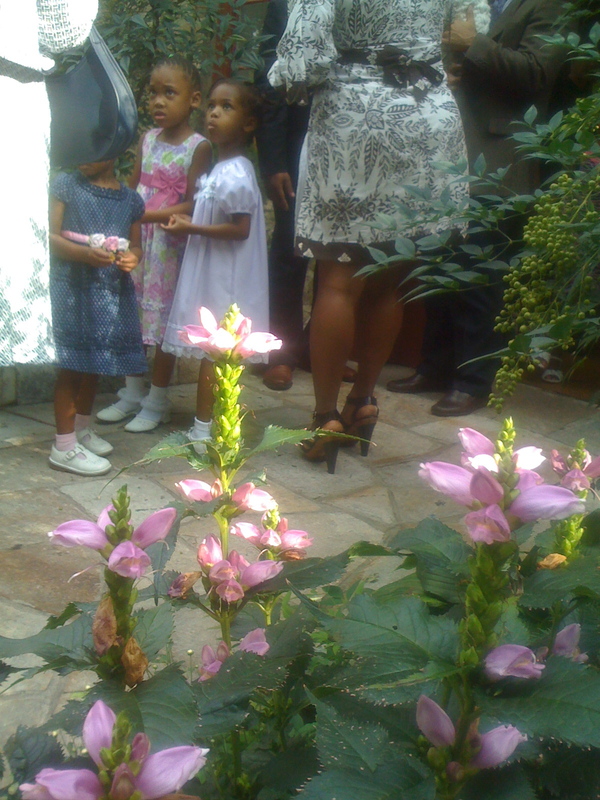 And the people were as radiant and multicolored as the flora. It was as if the gods said that it was ok for babylon to fall, just for this moment, to remind us of what we can be. The children ran carefree, with flowing dresses and little suits, allowing all the adults to care for them as if they were their dearest aunts and uncles. 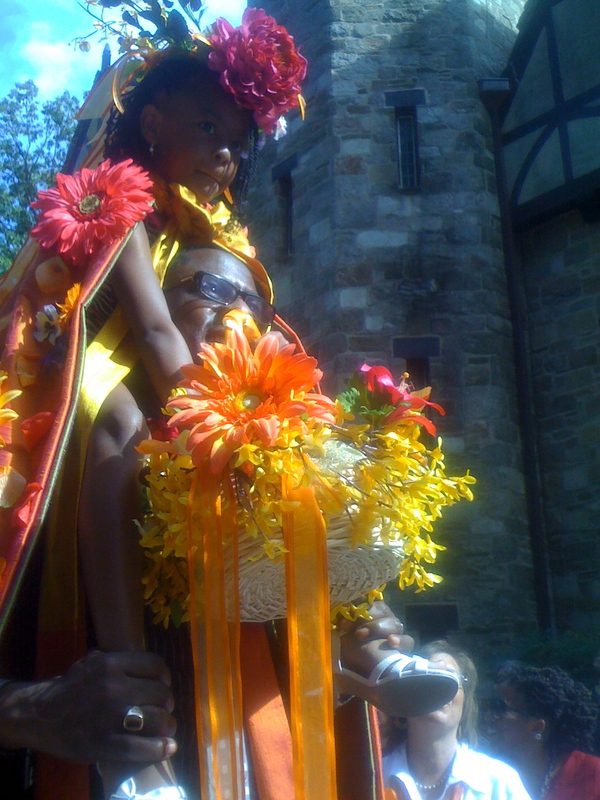 As the African Drums announced the procession, time stopped to watch. 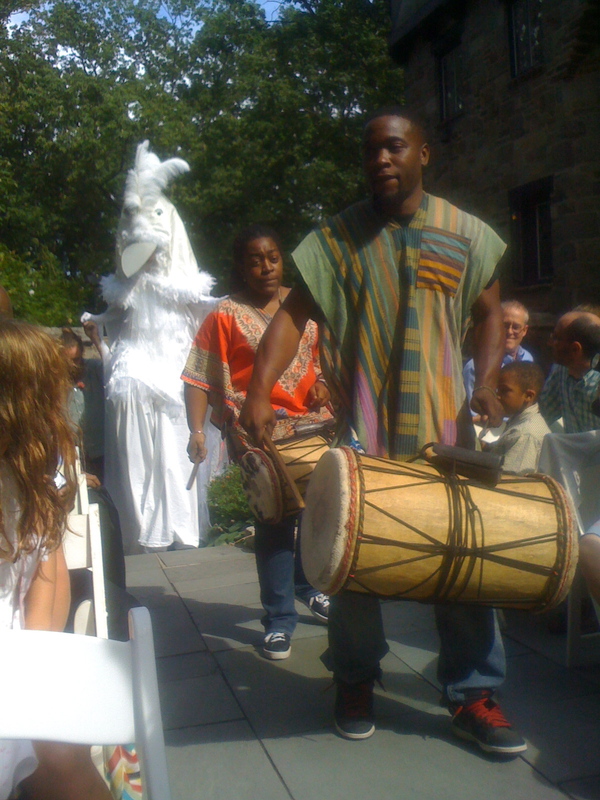 The drummers were dark, beautiful and strong. A stilted glowing white bird emerged from the castle reaching six feet above the heads of the procession. Then came the fathers with their daughters perched upon their shoulders, both adorned with huge flowered robes that flowed to the ground. 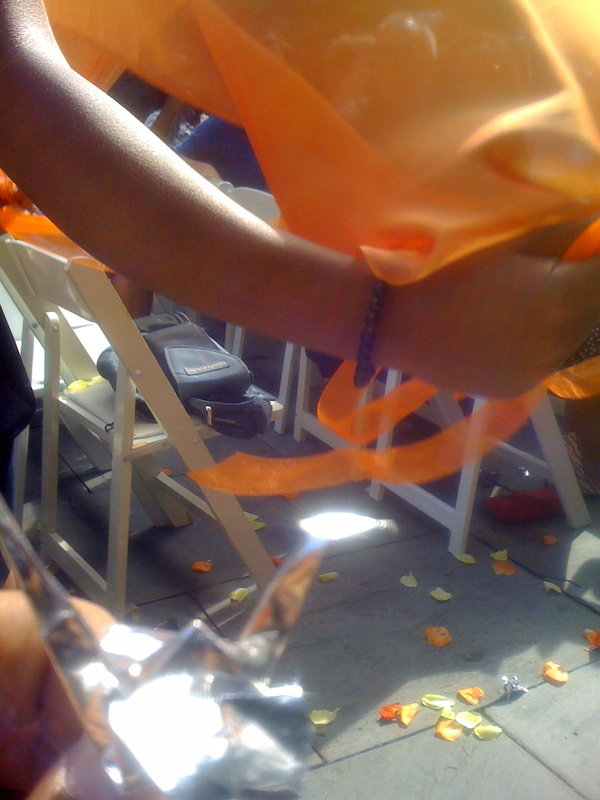 The girls distributed paper cranes, flower pedals, and rainbowed bubbles throughout the gathering. Feathered girls and tassle-capped boys followed ~ faces shining with the spectacle. The procession opened. A sound emerged that pulled open my heart to its breaking point as it moved through my soul. Radant Sisters, adorned in Gomesi and other traditional garb, hands opened to the heavens, moved and sang in harmonic waves as though our lives depended upon their song. Everyone, to the smallest baby was as still as a tree. When the song fell silent, Mark and Rebecca emerged, holding hands, joining their many worlds together. 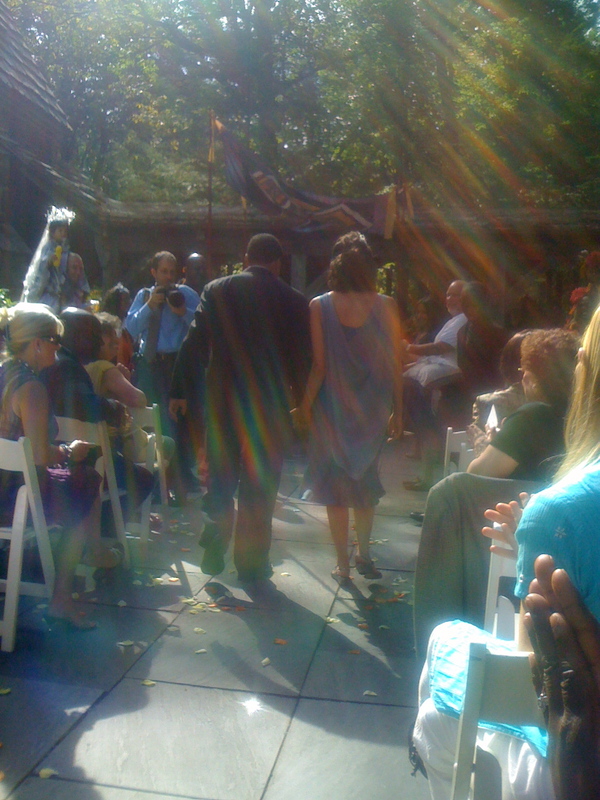 A Black, revolutionary healer, with a White, Jewish, creative, facing each other under a flowing chuppah held by witnesses honoring the four corners of the globe. They spoke intimate truth to each other and to us. They laughed and cried as we echoed the emotional honesty. In that foreseasonal moment, the world was in peace. and the tears flowed free throughout the cloistered garden. It does not matter that the summer’s heat has returned. Nor is it important that the divisions that set us apart in this post babylonian age, continue to tear at the fabric of humanity. I know, that this moment was a remembering forward, that we as humans will find a way to hear the song the Sisters sing again, and that we will learn their ways and weave the torn pieces of beautiful and tattered fabric together into a quilted tapestry that will cover, protect and adorn us all.